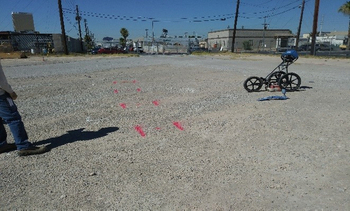 A general contractor had a project where they needed to drill borings & trench throughout an industrial complex. It was unknown of the paths of any existing utilities passing through the area especially the electrical feeds. The general contractor had to connect the future electrical conduits to the existing electrical feeds. Prior to proceeding it was essential they had information to which direction the existing electrical was running so they could tie into it & also so they didn’t compromise it during the excavation process. The general contractor also needed to know if any other existing utilities were present before proceeding with the trenching to ensure the safety of everyone involved. 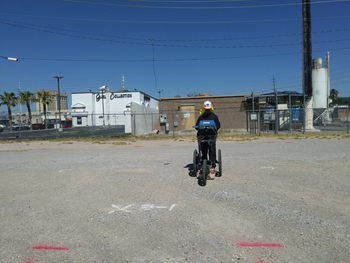 Ground Penetrating Radar Systems of Arizona was contacted by the general contractor to investigate the proposed trenching areas to locate any underground utilities. GPRS first investigated their surroundings to locate any above ground manholes to get an idea of what possible utilities may be in the area. This is good practice & important prior to beginning any utility locate. They utilized a 400 Mhz antenna to grid out the locations in both directions. An RD-8000, which is a radio detection device, was also used to perform the investigation. GPRS was able to locate the existing electrical feeds in real time & also a couple of other unknown utilities passing through the proposed area of excavation. This allowed the GC to plan for the trenching in advanced. All findings were communicated with the site Superintendent. Before your next trenching project in Arizona, contact Senior Project Manager, Thaddeus Bullock, at (480) 540-6092 or thaddeus.bullock@gprsinc.com.